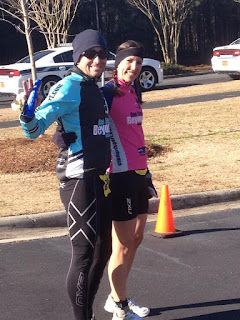 Bri and I both raced in the short course Cary duathlon over the weekend. It was 2.5 mile run - 17.5 mile bike - 2.5 mile run. Here you can see we were very nervous. 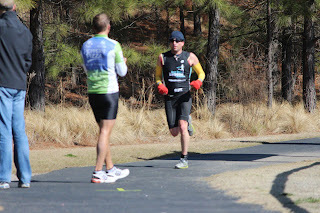 I have been doing no run speedwork and limited amounts of tempo on both the bike and run, so was just looking to have a decent race and enjoy the sunny day. Bri has been regular with harder run workouts so I knew she'd have my number on the runs. I thought she would get enough space to hold me off overall. 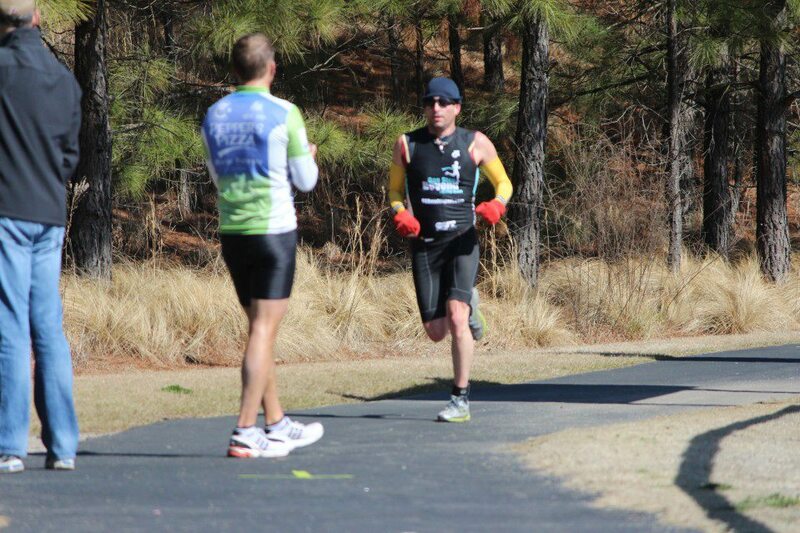 It was chilly, about 40-45 degrees, but sunny, so not bad overall. 300 people showed up for both events including a number of OSB athletes. First multisport race of the season is always good to work out the kinks. I forgot what a transition is. I ran conservatively on run 1, still paranoid about re-injuring my foot, but pace was right around 7 minute miles which is great for me. 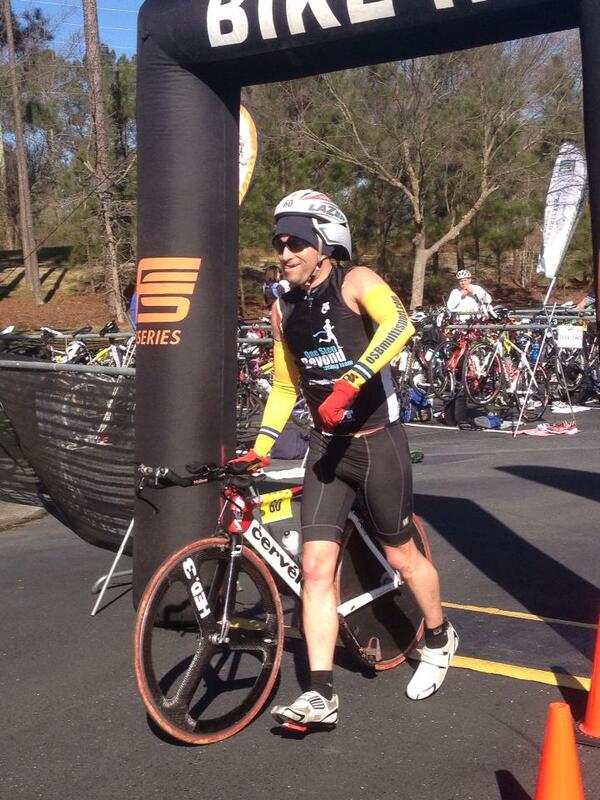 Bri was closer to 6:20 pace there and had a big lead going into the bike. Here I am slavering about catching her. Notice the determination in my fierce stare. I felt pretty good on the bike and did some mashing (big gear pushing), knowing it would cause me some pain on the 2nd run. But, that is what early season races are for. I caught several guys and 3-4 women that made it out onto the bike ahead of me. Caught Bri around halfway through. On the 2nd run I fought of calf cramps and then gave it the old college try. A couple young guys whizzed by me but otherwise I held my place. Finished in 10th overall and 3rd Masters (40-44). Bri made up 1+ minute on run #2 but it was not enough to take home the Gaal SmackTalk AeroHelmet of Awesomeness. 2nd overall female, not too shabby. 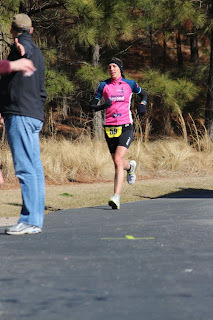 After the race I jetted home to relieve our babysitter who is willing to arrive early (thanks Rita!) as she had her own life to attend to, and then brought Junior Awesome back to the race site so he could play in the bouncy house. He loved it.